This entry was posted in Uncategorized on March 28, 2018 . (New York) – A new Science Channel series explores the suspicious deaths of scientific geniuses to determine if their demises were unfortunate coincidences or if these gifted minds were murdered for knowing too much. 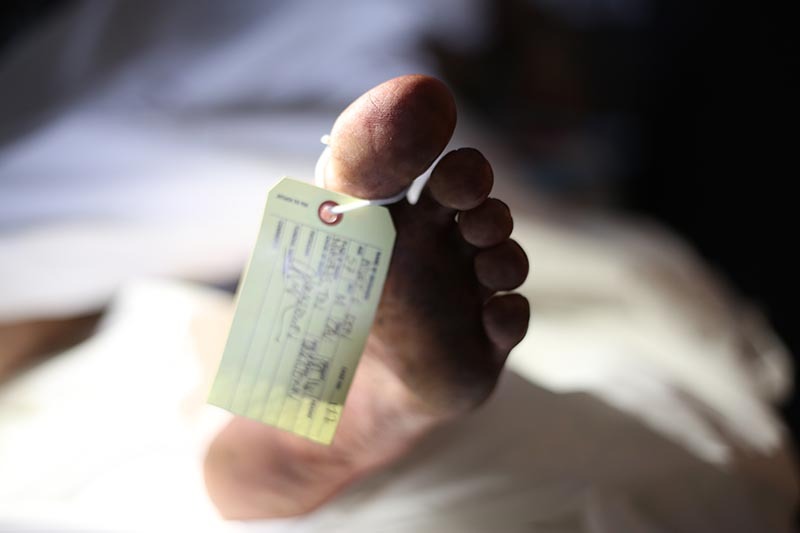 DEADLY INTELLIGENCE premieres Sunday, April 8 at 10pm ET/PT on Science Channel. What some experts have deemed cold or closed cases, others see as ongoing conspiracies based on bizarre circumstances, significant holes in investigations, and possible motives for murder. In each of the eight, hour-long episodes, experts unravel the mysterious deaths of cutting-edge scientists, each caught in a web of intrigue before their lives were cut short. DEADLY INTELLIGENCE takes a closer look at the circumstances surrounding some of these fatalities to understand if ingenious research and discoveries cost brilliant scientists their lives. The premiere episode looks to uncover the death of Frank Olson, a CIA employed biological warfare scientist, who died after falling out of the window of a New York City hotel in 1953. The official story is that he jumped, but his family believes he was murdered. One of the theories explored is that Olson, who witnessed brutal interrogations using biological agents he helped develop, may have developed misgivings about his work, leading the CIA to eliminate one of their own. Other mysteries explored this season include Nikola Tesla, the father of the ‘Death Ray’ who was found dead in a New York hotel room at the height of WWII; engineer Gerald Bull, who was gunned down outside of his Brussels apartment after his research in cutting-edge artillery made him a target among powerful associates; Jack Parsons, the Jet Propulsion Lab co-founder who had powerful enemies and has been suspected of espionage, and was killed in a suspicious lab explosion which may have been than a chemical mishap; American researcher Shane Todd who supposedly committed suicide in Singapore in 2012, but the work he was doing on a futuristic semi-conductor may have been what cost him his life; and more. DEADLY INTELLIGENCE is produced for Science Channel by Beyond Productions. For Beyond Productions, Martyn Ives is executive producer and Nick Long is series producer. For Science Channel, Lindsey Foster Blumberg is supervising producer. WASHINGTON, D.C., March 24, 2018 – Exceeding expectations, a huge throng of peaceful but passionate demonstrators filled the streets around the U.S. Capitol for today’s March For Our Lives in Washington, D.C. Addressed by teenage speakers from around the country who have been affected by gun violence, attendees rallied to demand legislative action. 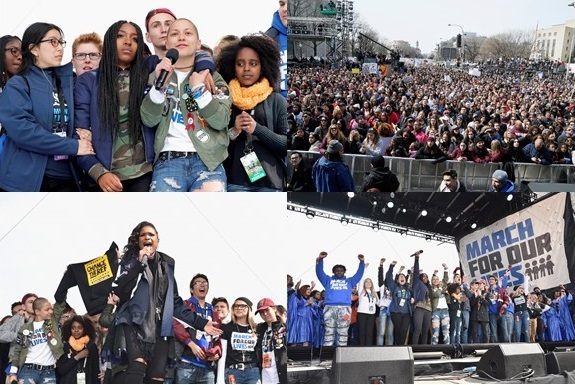 · Parkland survivor Sam Fuentes read a poem she wrote called “Enough,” and then led the crowd in a chorus of “Happy Birthday” for Parkland victim Nick Dworet, who would have turned 18 today. · Marjory Stoneman Douglas High School senior Emma Gonzalez sat onstage in silence for 6 minutes and 20 seconds, the time it took for the Parkland shooter to kill 17 people. · The crowd also heard powerful speeches from a group of students from Chicago—among them, Trevon Bosley (19), Alex King (18), D’Angelo McDade (18), and Mya Middleton (16)—about their experiences with gun violence in their communities. · Naomi Wadler, an 11-year-old from Virginia, proudly declared “Never Again!” on behalf of black women and girls who have been the victims of gun violence. 17-year-old Edna Chavez, of south Los Angeles, lost her brother in a shooting and said she learned how to duck from bullets before learning how to read. · Students from Newtown High School in Sandy Hook, Connecticut, presented a sign of solidarity to Stoneman Douglas High School. · Stoneman Douglas High School students Sawyer Garrity and Andrea Pena performed “Shine,” a song they wrote after the shooting. · Jennifer Hudson closed out the rally with a powerful performance of “The Times They Are A-Changin,” backed by a D.C. choir. As the student speakers joined her onstage, she led the audience in a “We Want Change” chant. March For Our Lives had secured a permit for 500,000 people for Pennsylvania Avenue between 4th and 12th St NW. Law enforcement partners confirmed that the audience exceeded expectations with crowds extending well beyond 12th street and out further than Pennsylvania Avenue. The stage, located at 3rd and Constitution Streets, NW, served as the hub for the day’s rally. The entire rally was streamed live on Twitter, Facebook, and YouTube. More than 800 sibling marches took place in cities around the world. For additional information, please visit MarchForOurLives.com and join the conversation on Twitter, Facebook, and YouTube using #MarchForOurLives. 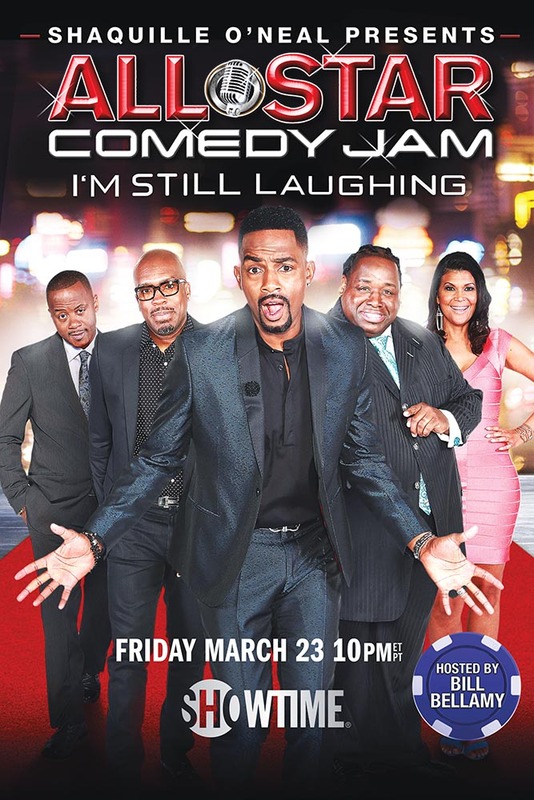 LOS ANGELES – March 22, 2018 – Comedian and actor Bill Bellamy (Any Given Sunday, How to Be A Player) takes center stage to host the eighth and final installment of Shaquille O’Neal’s comedy franchise, SHAQUILLE O’NEAL PRESENTS: ALL STAR COMEDY JAM: I’M STILL LAUGHING, premiering on SHOWTIME on Friday, March 23 at 10 p.m. ET/PT on-air, on demand and over the internet. Filmed at The Rio Hotel & Casino in Las Vegas, the new special features comedy veteran and fan-favorite Bruce Bruce (Think Like A Man, The Wash, Idlewild) teaming up with Huggy Lowdown (Tom Joyner Morning Show), Aida Rodriguez (Last Comic Standing, The Comedian) and Brian “Da Wildcat” Smith (2015 Winner of The Nationwide Shaq All Star Comedy Competition) for a hilarious line-up in a high-energy night of comedy. To watch and share a first look fromSHAQUILLE O’NEAL PRESENTS: ALL STAR COMEDY JAM: I’M STILL LAUGHING, go to:https://youtu.be/9rX5MOSuOhw. SHAQUILLE O’NEAL PRESENTS: ALL STAR COMEDY JAM: I’M STILL LAUGHING is directed by Leslie Small and executive produced by Shaquille O’Neal and Jeffrey Clanagan along with producer Valerie Benning Thompson. SHOWTIME is currently available to subscribers via cable, DBS and telco providers, and as a stand-alone streaming service through Apple®, Roku®, Amazon, Google, Xbox One and Samsung. Consumers can also subscribe to SHOWTIME via Hulu, YouTube TV, Sling TV, DirecTV Now, Sony PlayStation® Vue and Amazon Channels. The network’s authentication service, SHOWTIME ANYTIME, is available at no additional cost to SHOWTIME customers who subscribe to the network through participating providers. Subscribers can also watch on their computers atwww.showtime.com andwww.showtimeanytime.com. This entry was posted in Uncategorized on March 23, 2018 . After hitting the Breakfast Club, NY Times & Jimmy Fallon to promote his new memoir, Raw: My Journey Into Wu-Tang, which was released on 3-6 and his upcoming solo album, Venom, which will be released on 3-30-18 (and includes the lead-single, “Epicenter,” F/ Raekwon and INS Deck) U-God will be returning home to NYC for the final leg of his 20-city tour. U-God will be holding an intimate Q&A session for his new book on Monday March 26th at Housing Works Café. and he will also be at the Barnes & Noble in Staten Island on Thursday March 29th. U-God will celebrate the release of his new solo-album, Venom, with a release show performance on Friday March 30th in Brooklyn at Gold Sounds Live. 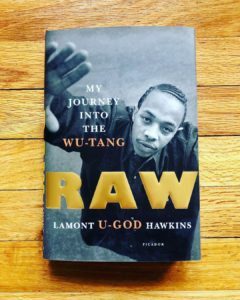 Recently, U-God imitated that he has a track with Cher and Redman on the top secret Wu-Tang album Once Upon A Time in Shaolin, what to expect from that project once pharma-bro Martin Shkreli is forced to relinquish it and how he almost smacked up Leonardo DiCaprio. This entry was posted in Uncategorized on March 19, 2018 . From Mass Appeal, Rapture stares directly into the bright light that hip hop culture shines on the world and doesn’t blink. Throughout 8 episodes and featuring a diverse swath of artists — Nas and Dave East, T.I., Rapsody, Logic, G-Eazy, A Boogie wit da Hoodie, 2 Chainz and Just Blaze – Rapture dives into the artists’ lives with their families and friends, to sitting front row in the studio and grinding on tour, to experiencing the ecstatic power of moving the crowd. About Mass Appeal: What started as a humble graffiti ‘zine in 1996 would soon grow to be one of the most trusted outlets for youth-spawned urban culture. Today, Mass Appeal is a content & media collective led by authentic voices and inspired minds. We are a platform for radical creatives who are transforming culture. With twenty years of living, breathing and documenting the urban experience, Mass Appeal stands as the premier translator, examiner and champion of cutting edge culture. Hip-hop is the new rock n’ roll, and the movement’s reach is boundless. This entry was posted in Uncategorized on March 14, 2018 . March 8, 2018 – Students who participate in Warner Bros. Pictures’ and New Line Cinema’s LIFE OF THE PARTY Premiere Promotion can help bring the party-and the movie premiere-to their city simply by showing they have more school spirit than their peers at other colleges across the country. Starting today, the Premiere Promotion will launch online at www.LifeofthePartyPremiere.com and via all WB social arenas. Just by posting a photo on a social media account depicting their school spirit and uploading it to the site, students will be eligible to make their school’s town the site of the LIFE OF THE PARTY World Premiere. Participants will also need to follow either the official “Life of the Party” Twitter or Instagram accounts (see links below) during the entirety of the Promotion to remain apprised of Promotion developments. In the spirit of March’s usual madness, the initial phase of the Promotion begins today, March 8, 2018, and entries will be accepted through 11:59 PM PT on Wednesday, March 21, 2018. Phase two begins on Friday, March 23, when the Top 25 universities vying for the Premiere will be announced on the website. Then the Promotion heats up between them, with the last school standing announced on Friday, April 6. 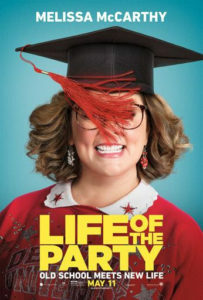 Starring the eternally youthful Melissa McCarthy, LIFE OF THE PARTY tells the story of longtime dedicated housewife Deanna who, when her husband suddenly dumps her, turns regret into re-set by going back to college-alongside her daughter-and plunging headlong into the campus experience! McCarthy and Falcone co-wrote the screenplay and produced through their production company, On the Day. Chris Henchy also produced the film, with Toby Emmerich, Richard Brener, Michael Disco and David Siegel serving as executive producers. New Line Cinema Presents an On the Day Production, “Life of the Party.” Slated for release on May 11, the film will be distributed worldwide by Warner Bros. Pictures, a Warner Bros. Entertainment Company. It has been rated PG-13. This entry was posted in Uncategorized on March 13, 2018 . Universal Television has closed a new first-look deal with writer/director Malcolm D. Lee for both comedy and drama projects. Lee has directed the box office hit Girls Trip and wrote and directed the Best Man franchise for Universal Pictures. 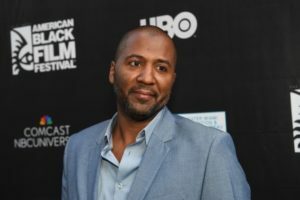 Malcolm D. Lee made history in July 2017 as the director and producer of Girls Trip, the first film with a full African American creative team in front of and behind the camera to surpass the $100 million mark at the box-office. Last summer’s runaway hit starring Regina Hall, Jada Pinkett Smith, Queen Latifah and the much lauded newcomer Tiffany Haddish, who has won several awards for her performance in the film, has grossed over $140,000,000 worldwide. Lee’s other credits include The Best Man (1999), which opened at No. 1 in the box office, and, to raves from critics and audiences alike. His other critically acclaimed films include Undercover Brother (2002), Roll Bounce (2005), Welcome Home, Roscoe Jenkins (2008), Soul Men (2008), The Best Man Holiday (2013), and Barbershop: The Next Cut (2016). This year, Lee re-teams with Haddish for his upcoming feature Night School (2018) starring Kevin Hart and Haddish. Lee currently has several feature projects in development including Rock the Bells, the next installment of the popular Best Man franchise, The Best Man Wedding, and a feature adaptation of Terry McMillan’s latest novel “I Almost Forgot About You” as a starring vehicle for Viola Davis. Lee’s television credits include directing episodes of the critically acclaimed Shots Fired and Everybody Hates Chris series. Lee will produce through his Blackmaled Productions banner. This entry was posted in Uncategorized on March 12, 2018 .